What a summer! For the small percentage of my readers who know me personally, understanding my absence from this blog is quite easy. For the rest of those who follow this blog, I apologize for my absence as these past few months have been consumed by some of my other passions (family time and cycling). During my hiatus from writing about my militaria passion one would suspect that I would have increased my collection and subsequently queued up a backlog of topics and subjects to capture your attention. Sadly (for you), I’ve done neither choosing instead to spend time immersed in a myriad of activities and projects. As certain as the coming of the autumn rain (I know, it is still technically summer for a few more days), my attention can now wander back toward military history and the related objects we collect. Speaking of working on projects, my collecting subsequent research has me steadily gathering items for a surprise shadow box for a family member. Without going into great detail, the subject of the shadow box was a Navy veteran of World War II enlisting a year (or so) prior to the Unite States’ entry. In fact, this sailor was serving aboard the USS Pennsylvania (BB-38) along with his older brother during the Japanese surprise attack on Pearl Harbor. 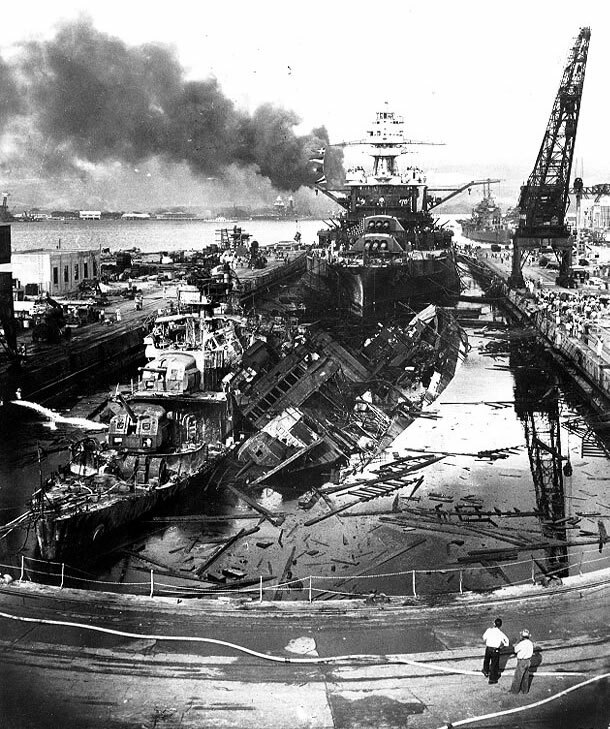 USS Pennsylvania (BB-38) smoldering in Pearl Harbor Navy Yard dry dock #1 along with USS Cassin (DD-372) and USS Downes (DD-375) following the Japanese attack (source: U.S. Navy image). Armed with scant few details, I embarked upon a search of available (online) sources to uncover as much data as possible in order to submit a detailed request (to obtain service records) to the National Archives (NARA). In order to create a complete shadow box (with all of the appropriate medals, ribbons, rating badge, etc. ), I need to be armed with the most accurate information about the veteran’s service as I can. One thing that I have learned through my experiences in dealing with records from NARA is that I cannot rely on the information as being entirely complete or the last, defining word in accuracy. In requesting a copy of my own “complete” service record, I noted that it lacked entire years of my service and resulted in the processor summarizing my career awards and decorations significantly short of what I actually earned. Fortunately for me, my command made an entire hard copy of my full service record upon separation from active duty. So, proceed with caution when using NARA-obtained service records and awards summaries. An example of a WWII Navy Veteran’s shadow box (my grandfather’s) is what I am going for with this project. For accuracy, it is best to have multiple data sources to both verify what one source states but to also discover any holes or gaps. Researching beyond individuals’ service records requires exponentially more work. If one can determine which commands (i.e. vessels) a sailor served aboard (using muster sheets), the researcher then needs to determine the specific history of that unit including campaigns and battles it participated in. This will help determine any unit awards the sailor might have earned that are not listed within the personnel file or service record. Due to their popularity and the nature of their service, researching unit history for a well-known combatant such as a battleship or cruiser can be much more simplified than that of a fleet tug or minesweeper. For the BB-38 and this relative’s service aboard the ship, the research is quite simple and the decorations are minimal (considering the ship spent the majority of the first sixteen months under repair and modernization). During her inactive time in the shipyards, the crew was sent out to the fleet to serve where needed. Following detachment from the Pennsylvania, this relative served aboard a destroyer followed by time in confinement (for fighting), ultimately being punitively discharged late in the war. Regardless of the manner in which his wartime service came to an abrupt end, looking back on the positives of this veteran’s wartime service and honoring it with a collection of artifacts that recognize that is a worthwhile project. This will be much appreciated by his family and serves to bring me back from my lengthy summer distraction from militaria collecting.